There are a couple things to be said about that. First of all, there can be a problem with this method of working through the commonplace and ordinary. But secondly, there is a great blessing for us in this remarkable way that God works. First, the problem. The problem with God working in such ordinary ways is the danger of people missing the whole point by seeing only the ordinary. The innkeeper did not know that by turning away that ordinary looking young couple he was playing a part in the greatest story ever told. If he could have seen that it was the Savior of the world who would be born that night he would have given them his own home and bed. But it was all so ordinary. How could he have known? Or take for instance Jesus’ first sermon in his home town of Nazareth 30 years later. He read from the prophet Isaiah about the coming Messiah and then said, “Today, this scripture is fulfilled in your hearing;” or in other words, “The Messiah is here, and it’s me.” But the people were angered by such arrogance, and ran him out of town. “Isn’t this the carpenter’s son?,” they asked. He was too ordinary for them. People often missed the point like that when they saw Jesus. Despite that risk, God still chooses to do great things by ordinary means. Baptism, for example, on the surface seems like such an ordinary procedure– a few words said, a little water on the head, and on to the next hymn. But in that ordinary ritual, says the Bible, God is giving that child an eternal promise. 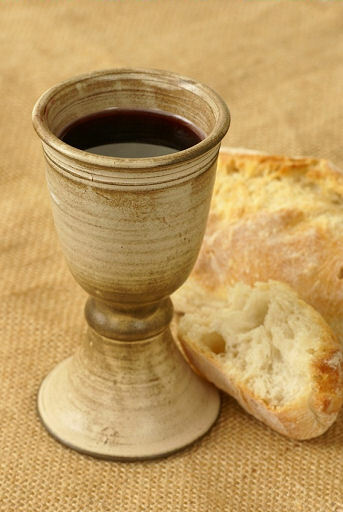 In the Sacrament of Holy Communion also, there are just a few words, a little wafer, and a sip of wine. It is all so ordinary. But, says Jesus, in those few words you receive the forgiveness of all your sins and the promise of eternal life. And there is the worship service itself. It is a weekly ritual, always pretty much the same, with an ordinary sermon by an ordinary minister, a few hymns, a few prayers, and a few mistakes. There is nothing extraordinary about any of it. But that is how God speaks to us, and how faith is nurtured and sustained over a lifetime. It is no ordinary meeting, God says, but what goes on when we worship is holy and is of eternal value, even though carried out by ordinary people doing ordinary things like talking and singing. But there are also great blessings in the ordinary ways that God works. We may not always appreciate the common blessings in our lives or the ordinary ways God works, but it is with the common-place and ordinary that we feel most familiar and most comfortable. Family life, for example, can be difficult and frustrating, but it is within the family that most people experience the most love and acceptance of their lives. Underneath the day to day tensions and disagreements, there is love and concern. It is there in the ordinary and the familiar that we experience some of the best life has to offer. And as God offers his companionship to us, he comes in the ordinary and the familiar. In fact, most of the Biblical images having to do with our relationship with God come from the ordinary images of family life: father, son, children, bride, bridegroom, a mother’s love, a father’s care, and so forth. In the same way, at the very center of this central story of the birth of Jesus is a holy family. So it is that the very ordinary and down to earth simplicity of the Christmas story has always had a great appeal to all kinds of people. In that story of a little baby born to poor parents in a stable there is a wonder and a beauty that can charm us all. God could have come to us in anger and judgment, but instead came as a baby. Even those who have stopped believing in the extraordinary aspects of the story, still find themselves each year drawn back to the story itself. And that attraction keeps them in touch at least a little bit, and the old, old story may again, one day, lead them back to the belief that it was indeed God in that manger. That is the appeal of the Christmas story– God comes as a baby. And that baby grows into a man– a man who works, who laughs, who cries, who prays, who was once a teenager, who has friends; a man who goes to worship each week, who gives advice on fishing, and who suffers and dies. In Jesus, God lived a life like us, and now knows what we go through because he himself experienced it all. This is not only the omnipotent, almighty God. This is Jesus we pray to, a human like us, and a friend we can talk to. He is certainly much more than human, otherwise he would not be able to save us. That other perspective is still always there, woven in a through the story just as in relationship with him. But this is a God we can get close to. We can be grateful God chose to work in such ordinary and familiar ways. Acts 4:13 — When they saw the courage of Peter and John and realized that they were unschooled, ordinary men, they were astonished and they took note that these men had been with Jesus. Gracious Lord, you created a real world as a place for us to dwell, and ourselves as physical creatures. We thank you that you come to us through earthly, natural means, to confirm your Word and accomplish your will. We ask that you would help us appreciate and honor the Sacraments as the tangible evidence of your promise, through Jesus Christ our Lord. Amen.